The ARI “FABA” is reliably sealed, even under the most adverse conditions. 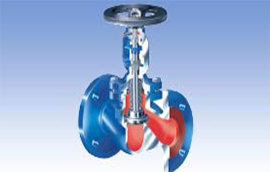 The bellows-type valve is maintenance-free and like all ARI valves – is classed leak rate 1 in accordance with DIN 3230T3. Standard: Steam, gases, hot water, thermal fluids, hot oil, process water, vacuum facilities, ammonia etc. Stainless Steel: Process water, aggressive media, etc.